Like most home appliances, water heaters have a limited lifespan. On average, a gas hot water heater will last for eight to fifteen years, depending on the model and manufacturer. Electric water heaters tend to last slightly longer, with an average lifespan of 10 to 15 years or longer. Over the course of your water heater’s functional lifespan, it will need regular maintenance and repairs. Conventional tank heaters, which are still used in most US homes, usually make it fairly obvious when they need repairs through leaks, cloudy water, and other visible identifiers. Below, we’ve listed five signs you need water heater repair or replacement. All five tips are written with tank-based water heaters in mind. If you have a tankless heater, there’s no need for you to worry about most of these issues. Have you noticed a cloudy look on your home’s water? Over time, your tank heater might fail to properly filter out mineral deposits from the water it sends into your pipes, resulting in water that looks slightly gray and cloudy. Cloudy water can be difficult to spot if you have stainless steel or stone sinks, as the water can blend into a non-white background. One easy way to identify cloudy water is to fill a glass with water, then hold it against a white background to check its color and texture. Often, cloudy water is accompanied by a slightly metallic taste and scent. This is a result of minerals making their way into your water supply. Sometimes, your water heater can develop rust, which results in a slightly orange tint to your water. Rusty or cloudy water generally isn’t a significant health risk, although it’s best to avoid drinking any tap water if you notice a significant lack of clarity or unusual coloration. In either case, it’s important to take cloudy or rusty water seriously. Both signs indicate that your water heater needs to be repaired or replaced. Most of the time, your plumber will recommend a completely new water heater replacement to replace one that’s causing cloudy or rusty water. When they’re brand new, tank-based water heaters are usually extremely quiet, running silently as they heat your home’s water supply. However, over time, sediment can build up inside your water heater, creating irritating noises that can indicate that something’s wrong. Tank water heaters generally create one of several noises as they get older. The most common is a popping sound. This sound happens when minerals build up inside your water heater and create a layer of sediment on the surface of the water. As the water is heated, the air inside the sediment layer can create a popping sound. Most of the time, this problem can be fixed by draining your water heater and flushing out any excess sediment. This is a service almost all experienced plumbers will offer. Some water heaters can also develop a rumbling, creaking sound over time. Again, this sound is usually the result of sediment building up inside the tank. Many cases of rumbling noises from a water heater can be solved by removing the sediment from the heater and cleaning the tank. In some cases, cleaning out your tank and removing sediment isn’t enough to stop noises from occurring. This is most common in older, heavily used tank heaters. Most of the time, the best solution is to simply replace the water heater with a newer model. One of the most obvious signs of a failing water heater is a lack of hot water. If your water feels cold or only manages to reach a lukewarm temperature no matter how much you adjust the tap, it could be the result of a failing or damaged water heater. Have you experienced this problem? Remember that tank heater has a limited capacity and can’t provide endless hot water. If you’ve used a lot of hot water recently, the lukewarm or cold water coming out of your tap could be due to your tank not having enough time to heat up. Tank heaters can fail to produce hot water for a variety of reasons. In many cases, lukewarm or cold water is the result of sediment buildup preventing the burner from properly heating the tank water. This is a problem that’s easily fixed by draining the tank of sediment. In other cases, the problem is mechanical, with the burner no longer functioning properly or the tank draining itself of hot water due to a leak. 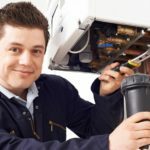 In either case, an experienced plumber will have no problem diagnosing the root cause of the problem and recommending a solution. Leaks are another obvious sign of damage to your water heater. Over time, sediment can build up inside your water tank. This sediment can brush against the sides of the tank, resulting in the materials used to build the tank weakening, fracturing, and cracking. Water can also leak from your tank due to damaged valves, particularly the pressure relief valve that’s designed to relieve pressure in the event of excessive heating. If water is leaking out of your tank heater, it’s vital that you take action as rapidly as possible. A leak can quickly worsen, resulting in serious damage to the area surrounding your tank. If it’s left for too long, it could damage other areas in your home depending on where it is located. Noticed a leak? 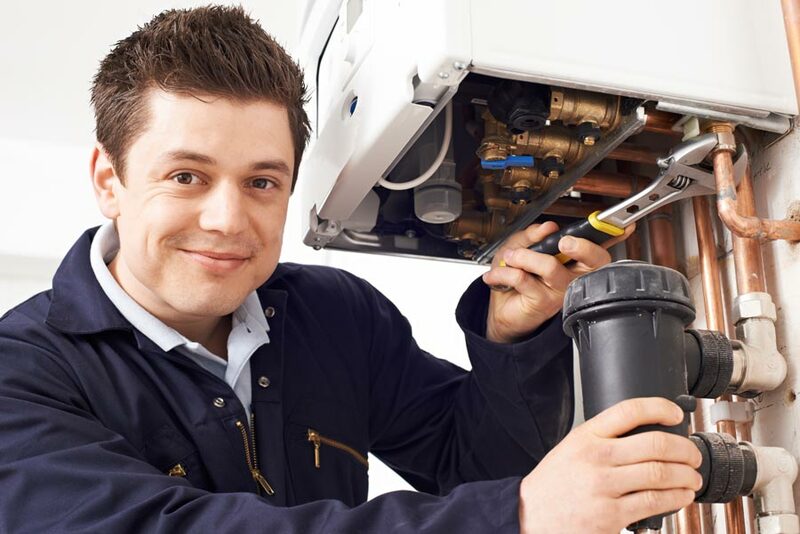 If you’ve noticed water leaking out of your tank heater or wet areas around the heater, the best approach is to call an experienced plumber as soon as possible to identify the cause of the leak and replace your water heater. Corrosion around your water heater can indicate that the tank itself or the pipe fittings are damaged. Corrosion is usually easier to spot than a small leak. As water leaks through the tank or sealed pipe fittings, it can cause the metal used to construct the tank to rust. On most water heaters, a failed pipe fitting can result in the development of obvious, easy-to-spot rust. Rust on the outside of your water heater usually indicates a “slow leak.” While slow leaks aren’t as urgent as obvious, dripping leaks caused by cracks and other structural damage to your tank heater, they can still cause significant damage over the long term. Depending on the extent of the corrosion, your water heater might no longer work as efficiently as it once did. In some cases, however, tank water heaters still work even with a large amount of exterior corrosion. Just like with other leaks, it’s important to contact an experienced plumber the moment you spot corrosion around your water heater. They’ll be able to identify the cause of the corrosion and let you know whether your water heater can be repaired or needs to be completely replaced.